Address: 38 Shlomo Hamelekh st.
Young, hip, single and artistic Tel Avivians love to come to Shine to hang out, meet new interesting people or to have brainstorm sessions for work. It's tucked away in a quiet street, just perfect if you want to escape the bustling streets near the center but don't want to wander off too far away from it. Except for the usual coffee, alcohol and other beverages, Shine also has a really good and healthy menu. The vegetarians enjoy the salads very much, but also the to fu curry with vegetables and wild rice. 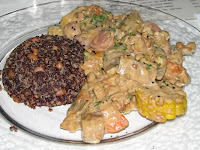 The curry has a delicate creamy flavor and they use a special version of tofu, named tempeh. Also the risotto with seafood is quite tasty. 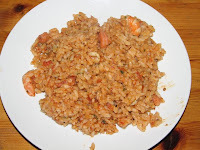 The risotto isn't the creamy version, instead it's savoury and made with a great broth of seafood and it has small shrimps and calamari mixed through it. The portions of each dish are quite big and can be easily shared, if you're both not big eaters. Walk on Dizengoff and turn right (facing north) to Frishman st. Go straight till the corner with Shlomo Hamelekh st.